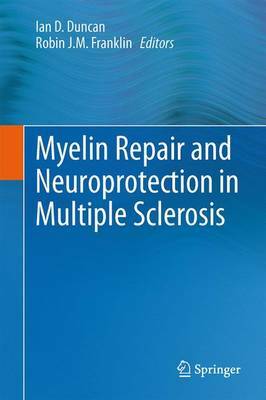 Myelin Repair and Neuroprotection in Multiple Sclerosis presents an up-date on the translational potential of promoting remyelination in multiple sclerosis (MS). A number of research frontiers still exist in this challenging disease. The cause remains elusive, preventing breakthroughs in its prevention. The move towards oral immunomodulatory therapies has been a major advance, as has the finding of new genes linked to susceptibility that may open the door to new therapeutic approaches. However, a frontier that has been making significant strides in recent years has been that surrounding the neurobiology of myelin regeneration and axon protection: such have been the advances that clinical translation is on the cusp of being achieved. Two broad approaches to therapeutic enhancement of remyelination are envisaged: promoting endogenous remyelination by targeting cells present in the CNS, or, replacing lost myelinating cells from exogenous sources. Current research on oligodendrocyte biology, the pathology of MS, imaging of lesions and the biology of remyelination are paving the way toward opening this new translational frontier. Professor Duncan and Professor Franklin have assembled a broad group of experts in the fields of glial cell biology, neuropathology, radiology and clinical neurology to provide the background toward taking remyelination from experimented models into MS patients.